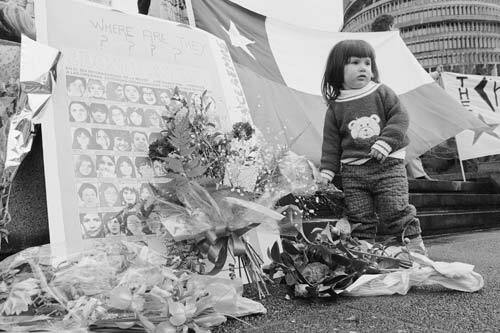 This child is taking part in a commemoration of the 17th anniversary of the death of Chile’s former president, Salvador Allende. Many Latin Americans, including the relatively large number of Chileans who arrived in the 1970s, came to New Zealand as political refugees. Concern for political issues in their home countries remains, and they played an important role in left-wing activism in New Zealand during the late 20th century. In 1990 they staged a protest in Wellington against the repressive rule of General Pinochet in Chile. hey thanks for the info! it helped me with my inquiry questions!